What makes some weddings such a success? How do you ensure your wedding is a blast, and that everyone who attends will have such a good time that they will be talking about it for years to come? Weddings cost a lot of money and take plenty effort and emotion to plan. Although all weddings have the same basic ingredients – a glowing bride, nervous groom, flowers, food, family and friends – certain weddings stand out as being extra memorable and fun celebrations. The secret to having an extra special standout wedding is that everyone attending the wedding, including the bridal party and all the guests, has a superb time from when they arrive to when they leave. Most brides get swept up with planning all the finer details and get carried away with the look of their weddings – the flowers, decor, bridal gown, bridesmaids’ dresses and so on. But just because everything looks great, it does not mean that people will enjoy themselves. It’s not rocket science – people are pretty easy to please. Give them a regular supply of good food, flowing drinks, something to entertain them, physical comfort and a good atmosphere, and voila – party of the century! When planning your wedding, start with these three areas, focus your spend on getting these right, and then build from there with all the other elements. Odds are, you won’t eat much at your own wedding. With all the running around, nerves, photos, formalities and socializing, your food may be left untouched. Food, however, is the single most important factor for your guests. It’s what they will talk about afterwards, and forms the foundation for their wedding enjoyment. You need to look at quality, quantity and timing. Don’t leave your guests for any prolonged period without something to fill the gap. Make sure all the food looks and tastes good, and that your caterer has not skimped on the quality of ingredients. Don’t trust a menu price tag that looks too good to be true – it always is! If you pay cheap, you will get cheap – caterers are in business to make a profit, and they will be forced to skimp on quantity and quality if you pay too little. Speak to people who have attended weddings at your venue, or events with the same caterer before confirming your booking. Not just the bridal couples – they always get extra special service – talk to run of the mill guests to get an accurate indication. Don’t be shy to ask your caterer for references or a tasting. Ask your photographer, DJ and videographer about the food at your chosen venue – they regularly eat at all the different wedding venues. Too often, I hear bridal couples saying they are not going to pay for any drinks and then they spend huge amounts on other incidental items which often go unnoticed and unappreciated. It’s quite acceptable to have a cash bar, in fact most guests expect to fork out for their booze. But, complimentary drinks are always such a pleasant surprise, and definitely add to the vibe of the affair. I’m not saying you need to have an open, unlimited bar – few people have the means to go that far. Think signature cocktails in your colour scheme, wine and champagne on demand, beers on ice and possibly a whiskey and cigar station, and you won’t regret it. Subtle things like music and lighting can make or break a party. Bright lights can kill a romantic atmosphere and not many people want to let their hair down and dance under a spotlight. Think candlelit dinner, mood lighting with floodlit colour, and flashes of sparkle for the dance floor to set the tone. 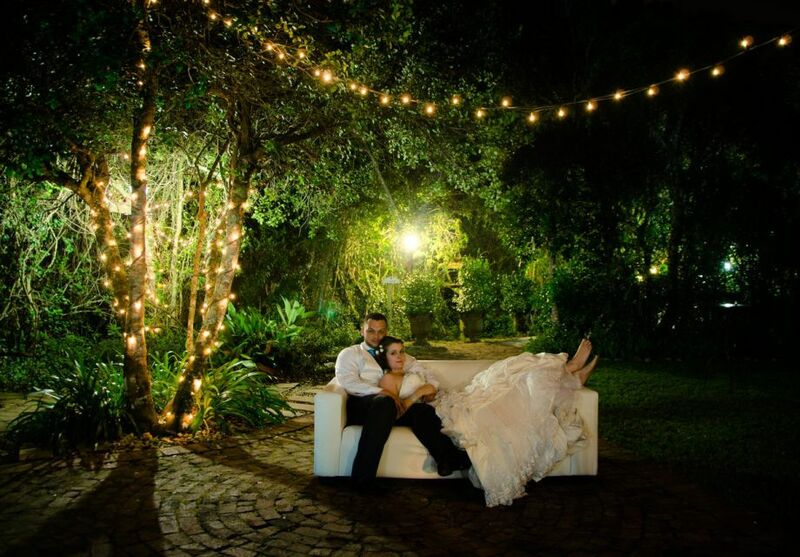 Make sure lighting is dimmable, and that one of your suppliers is tasked with managing your lighting to fit the proceedings – so it’s bright when it needs to be and a romantic glow the rest of the time. to attract all your guests to the dance floor and keep them boogying into the wee hours. They will also ensure that the speeches go off without a hitch, adjusting the microphone to suit each person’s voice and avoiding any embarrassing technical hiccups. Live musicians always add something special, particularly during the ceremony and cocktails. They are expensive though, so if your budget doesn’t stretch that far, make sure that appropriate music is played via a sound system, and that a professional is in charge of monitoring it. When deciding on a band or ensemble, try and hear them first. It’s wise to choose musicians who have played at lots of weddings as they will have a better understanding of when to play what music, and how to avoid any awkward silences. I always feel that a DJ is better for dancing, as they are able to play all sorts of genres – something to suit everyone at the wedding, and all the popular tracks. With live bands, they have a certain style, and hearing only that sound for the whole reception can be a bit much. One or two sets while you are having your photographs done is ideal as it entertains the guests, and sets the scene for the rest of the reception. Think of the physical comfort of your guests at all times. Look at the climate at that time of year and the weather forecast. Make sure that your guests don’t shiver or sweat – it’s pretty hard to enjoy yourself when you are freezing or wilting. The concept of locking your guests out of the reception hall so they don’t spoil the look of the table decor is bizarre. Happy guests make a memorable wedding, not perfectly untouched tables. There is nothing like a roaring fire in winter, or chilled aircon mid-summer. Provide things like umbrellas for rain, hand fans for the ceremony, knee rugs outside in winter. Your guests will notice, appreciate and enjoy! Fact 1: Girls like to dress up for weddings. Fact 2: Killer heels are called that for a reason. Don’t leave your guests standing for hours at the start of your wedding. Make sure there is enough occasional seating for the ladies and older folk to rest their well adorned feet while you are having your photos taken. Place the seating in scattered clusters to encourage mingling, and provide enough seats for at least half your guests. Lastly, don’t forget your guests with special needs. Think of the comfort of your older relatives and any disabled guests. A wedding is one occasion where all generations come together in a happy celebration of love. Don’t only plan for the young and able – this may be one of the last highlights you share with your grannies and granddads – make them feel extra special by providing for their every comfort. Think of it this way – you won’t be hanging a photo of your wedding decor over your fireplace. Photos of family and friends laughing and sharing your happiest day with you will adorn your home and remain in your heart forever. Remember these three secret ingredients when planning your big day, and you won’t go wrong. We’d love to hear your opinion – please let us know if you agree by leaving a comment below, and share this post with your friends!